HUNTSVILLE, Alabama -- A recent report that shows tornado and hail patterns extending beyond the traditional "Tornado Alley" isn't really news to this area. However, to a national research/analysis firm and insurance companies, the "Tornado and Hail Risk Beyond Tornado Alley" report is a real eye-opener. The report, through CoreLogic, which is known as a provider of housing and real estate date, includes charts, images and risk maps for the top 16 states outside of the traditional Tornado Alley corridor with the greatest exposure to tornado and hail disasters. Needless to say, Alabama is in the top 16. 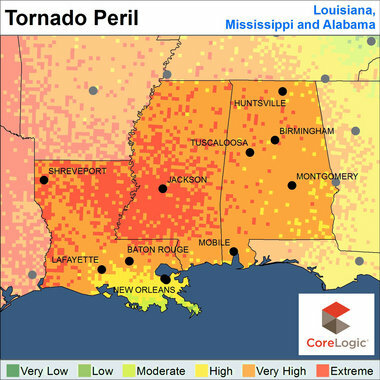 "The extensive destruction wrought by convective storms in 2011, which produce hail, strong winds and tornadoes, captured the attention of the public and forced many insurance companies to rethink the way they assess natural hazard risk," said Dr. Howard Botts, vice president and director of database development for CoreLogic Spatial Solutions. "The apparent increase in the number of incidents and shift in geographic distribution of losses that occurred last year in the U.S. called the long-held notion of risk concentration in Tornado Alley into question, and is leading to changes in risk management policy and procedure." Tornado Alley is typically considered to encompass mainly the Great Plains states and surrounding areas, spanning Texas, Oklahoma, Kansas, Nebraska, Colorado, North Dakota, South Dakota and Illinois. Last year's "Super Outbreak" that included April's tornadoes that ripped through this state and, later on, the tornado the practically destroyed Joplin, Mo., was considered by some to be an "anomaly" because it happened outside "Tornado Alley." "The big surprise was the insurance companies thought the risk was in the Great Plains," Botts said. However, CoreLogic's data suggests that the frequency and severity of storms is much more widespread than commonly believed. And, in the wake of the tornadoes here on March 2, the frequency is likely to continue. "It seems like there's been a lot of activity this year," Botts said. "We're in a very dynamic phase." He said the report was made to help insurance companies and homeowners realize the risk from tornadoes and hail in their regions. "CoreLogic has two sides," Botts said. "There's the housing data side and the other side focuses on flood and hazard risks, to sell that information to insurance companies." He said the report includes hail risk because "most of the losses are to wind and hail damage." "In your area, the hail risk is quite pronounced." • There is growing scientific evidence that there has been an increase in the actual number of severe weather outbreaks as the result of rising global temperatures. The report also said that the losses associated with severe weather events in 2011 will likely cause many insurers and enterprise risk managers to approach states with rate change requests this year. And, in the case of dozens of local residents, even the outright cancellation of policies. "I think the insurance companies are trying to be more intelligent by working with city officials, states and homeowners to understand the risks they take," Botts said. Budd McLaughlin can be reached at budd.mclaughlin@htimes.com and 256-532-4527. Archeological evidence was taken out of context, asserts USF professor Christian Wells. TAMPA, Fla. (March. 20, 2012) – With doomsday looming in the near future, Christian Wells, associate professor of Anthropology at the University of South Florida and a well-known scholar of ancient Maya culture, sought to dispel misconceptions about the fate of the world on Dec. 21, 2012. Wells’ presentation Monday night was a kick-off to “Visions of the Apocalypse,” a three-day lecture series held by the Humanities Institute as part of their annual science fiction symposium. The Spanish forced some reinterpretations of the Maya doomsday through torture to make it match Revelations, a book of the Bible filled with images of hellfire and damnation, Wells said. From this, individuals ripped off ideas from various New Age religions and science fiction writers to create the concept of “Mayanism,” which includes the belief that the world will end this December, Wells said. It’s unlikely the Maya thought the world could end Dec.21, 2012 considering they had predictions of future cycles thousands of years beyond our future. New Age religions and the popular press globalized the narrative, Wells said, and by wrenching it from its cultural, historical and geographical context, shifted the context from sustainability, the end of an old cycle and beginning of a new one, to doomsday. On Tuesday, March 20, science fiction authors, Joe Haldeman and Nancy Kress, read excerpts from their books and discussing apocalyptic beliefs in the TECO Room in the Education Building. Kress signed copies of her new book, After the Fall, Before the Fall, During the Fall, while Haldeman presented his 2011 book Earthbound. On Wednesday, March 21, Kress and Haldeman will be joined by USF chemistry professor David Merkler and religious studies professor Dell de Chant for a panel discussion on our cultural obsessions with the apocalypse. That event will be held at 2 p.m. in Marshall Student Center, room 3705. Daylina Miller can be reached at 813-500-8754. MSNBC interview: 2012, the year the Earth doesn’t end. Again. The panel was fun — I gave an overview to and quickly debunked a bunch of 2012 claims, while JPL scientists Don Yeomans and Veronica MacGregor talked about asteroid impacts, and what NASA is doing to calm unfounded fears about them. Asteroids are indeed a threat, but that danger is routinely exaggerated way beyond reality by lots of folks (YouTube fearmongers, I’m looking atyou). There’s no real danger of the Earth ending in 2012, Mayan calendar-wise or otherwise — but the real danger is the overhyped fear of nonsense. The Afar Depression in Ethiopia is a point where three of Earth's tectonic plates meet and are pulling away from each other, creating enormous stress on the rock, producing cracks, faults and volcanoes. The pulling apart here will eventually result in the formation of a new ocean basin. Several winters ago, a team of geophysicists from Missouri flew to the eastern edge of Africa, strapped on bulky backpacks and began walking. They were looking for a set of huge stripes in the Tendaho Graben, a place within the Afar Depression of Ethiopia, where Africa's continental crust is stretching thin and a new ocean will eventually form. But the stripes they sought — and eventually found — aren't visible to the naked eye. They're magnetic stripes, similar to the ones lining the ocean floor at mid-ocean ridges. David Bridges, a geophysicist from the Missouri University of Science and Technology, and his colleagues sniffed them out using a bit of geological detective work, lots of walking and the hulking magnetometers strapped to their backpacks. The Tendaho Graben's magnetic stripes are important because they're the first ones scientists have documented on land, Bridges said. Even more importantly, because these stripes have formed before the area becomes a water-covered basin, they may change the way researchers interpret the planet's oceans. What Does 2012 Have In Store For You? Shockingly Accurate. See Free! Improve memory and attention with scientific brain games. 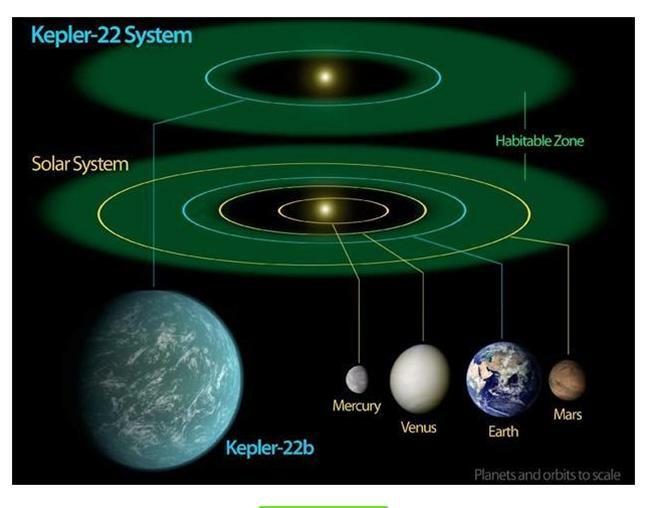 "The really interesting thing is that some of the oceanic basins may perhaps be a little bit younger than we currently believe," Bridges told OurAmazingPlanet. The underwater relatives of Tendaho's magnetic stripes were first documented in the 1950s by geophysicists who set sail to take thousands of seaboard magnetic readings. The researchers eventually began to see that their readings sketched out distinct sets of stripes running parallel to mid-ocean ridges, and that each stripe's magnetic alignment was the reverse of neighboring stripes. The striped magnetic pattern develops because, as oceanic crust pulls apart, magma rises to the surface at mid-ocean ridges and spills out to create new bands of ocean floor. Ferromagnetic minerals in the hot magma align themselves with the Earth's magnetic field, which completely reverses its north-to-south polarity every now and then, and freeze in that alignment as the magma cools. Later, after the planet's magnetic field flips again, the next stripe of new ocean floor aligns its polarity in the opposite direction. "For many ocean basins, the timing of their openings has been based on the appearance of these magnetic stripes," because scientists long believed that the stripes first appeared when seafloor spreading started, Bridges said. But the stripes that Bridges' team found in Tendaho may prove that conventional wisdom wrong. Tendaho's magnetic bands, which measure 6 miles (10 kilometers) wide, are embedded in continental crust, not oceanic crust. And unlike magnetic stripes on the ocean floor, Tendaho's formed through diking: as the African crust stretched thin, streams of magma intruded the continental crust and hardened. Like in the oceanic stripes, ferromagnetic minerals in the dikes aligned with the planet's magnetic field as the magma hardened. Their magnetic signals are very similar to those of ocean-floor stripes. This all happened sometime between 1.8 million years ago, when the region's continental crust began to break apart, and 780,000 years ago, when the Earth's magnetic poles last flipped, Bridges said. Scientists predict it could be as many as 2 million years before the crust in the Tendaho Graben ruptures and begins to form an ocean basin. Altogether, this means that Tendaho's magnetic stripes could predate the future ocean basin by nearly 4 million years. And magnetic stripes may predate other ocean basins, too. "Other groups have found evidence suggesting that perhaps the Atlantic basin opened up a little later than what's currently believed," Bridges said. "It's sort of an interesting time in this field." NASA | Massive Solar Flare gets HD Close Up - YouTube: " "
Floods in Victoria's sodden northeast have been described as a one-in-100-year event, and waters may take weeks to fully subside, residents have been warned. Victorian Premier Ted Baillieu and Deputy Premier Peter Ryan toured flood-affected towns on Sunday, seeing the impact of up to 160mm of rain dumped on the region in 24 hours following a week of heavy downpours. Numurkah and Nathalia, north of Shepparton, are the towns the State Emergency Service now says are most under threat. Patients were evacuated from Numurkah's hospital, while about 30 residents were relocated from an aged-care home in the town on Sunday. About 38 soldiers joined emergency services in sandbagging ahead of the water's expected peak on Monday. SES crews are preparing a flood barrier at Nathalia in an effort to protect properties. At least eight properties in the town were isolated on Sunday, SES spokeswoman Dimity York said. "Flooding has exceeded 1993 levels, so this is now a one-in-100-year event," Ms York told AAP. Technically, the term "100-year flood" means there is a one per cent chance of it happening in any given year. Waters are starting to recede in the towns of Tallygaroopna, Tungamah and Katamatite, Ms York said. Roads into Tungamah have reopened, allowing food supplies in. Mr Baillieu said residents would face significant challenges in coming days as water continued to move through some towns. "We can be comforted by the fact that for the next few days the forecast is not as daunting, but that means that everybody needs to continue to pay attention, continue to stay in touch with their neighbours and to listen to broadcasts," he said from Wangaratta. Mr Ryan said residents had shown extraordinary resilience. "For some of these people they are having water over the boards for the fourth time in a little over 12 months," he said. "It is a terrible experience for them and we will continue to do everything we possibly can to support them. But their resilience in the face of this is nothing short of amazing." More than 100,000 sandbags have been filled in the state's northeast as 800 SES volunteers fight to hold back advancing waters. State Emergency Service regional officer John Newlands says residents in affected towns must be patient, as water would take time to clear from plains. "It is a very slow-moving area. The water will stay around ... we could see operations going on there, not for days, but it could be a couple of weeks as the water slowly moves towards the Murray," Mr Newlands said. Department of Human Services staff and the Red Cross are on hand to provide residents with accommodation and other emergency help. Flood warnings remain in place in the northeast and East Gippsland, where some areas have received four times their monthly average rainfall in four days. Bureau of Meteorology senior meteorologist Phil King says the Ovens, King, Mitta Mitta, Goulburn and Upper Murray rivers were hardest hit by the unseasonal rains. The highest rainfall was at Mount Buffalo, where 163mm of rain fell in 24 hours. "Much of the river systems are already in flood and this is going to bring renewed flooding," Mr King told AAP. "In the short term we'll still see moderate to major flooding in those northeast river systems and that will take a number of days to go down. "So the rain is easing but the flooding situation is not over." Authorities say it is too early to estimate the damage bill from the floods, which is set to spiral into the millions of dollars.